The day has been set aside to give thanks and praises to God for the peaceful conduct of the country’s March 2018 elections. According to members of NPM SL, the thanksgiving service would be held at the Flaming Bible Church on Ascension Town Road in Freetown, and that the session would be broadcast live on television. 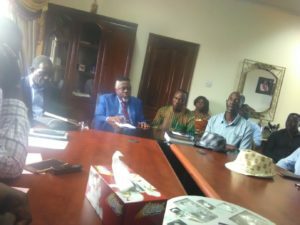 Speaking during a presser at the Flaming Bible Church, Chairman Christian Prayer Organisation, who also doubles as Founder and Leader of the Flaming Bible Church Ministry, Bishop Dr. Frederick Abu Sidique Koroma, said before the March 7th elections, there were signs of violence all over the country. He said it was against that background that he decided to call on other church leaders in the country to come together and pray against conflict in the country before, during and after the elections. He said leaders from different churches in the country adhered to the call and started holding meetings, and that they divided themselves into groups and started praying for the country. “The way things were going before the election was terrible and everybody was thinking that there was going to be war in the country. Some people even left the country and went abroad. It was on that reason we came together and prayed for the nation’s peace that we are all enjoying today,” Bishop Koroma said. He said they hosted prayer sessions at many places, including under the Cotton Tree, east of Freetown and in the provinces. He said they also went to the mountains for three days, praying day and night for peace to be on the face of Sierra Leone. He said God answered their prayers and that since the country conducted peaceful elections, they have decided to organise a national day of thanksgiving for the country on the theme ‘God Answers Prayer’. Also speaking, Rev. Martha Chigozie, Head of Protocol for NPM SL, said because they came together, prayed and God answered their prayers, they also thought it fit to come together and thank Him. She disclosed that the thanksgiving would commence at 3 p.m. on Sunday, 8th July, thus inviting everybody, irrespective of the church the individual belongs to. Thank you, Dr. Koroma and NPM- SL for going back to Hashem (G-D) to say thank you. This has been in my Spirit since last November 2017 when the date for the election was announced. I had a revelation of what the enemy had secretly planned for SIERRA LEONE. So, we in the Diaspora called for prayers and fasting until and after the elections. Hashem (GOD) that answereth by fire, answered us by fire. We thank GOD for cancelling the plan of the enremy. I personally thank you guys for coming up with declaring a day of thanksgiving and let us know in the Diapora whether its going to be an annual event.